Rapamycin and its analogs (rapalogs), those are the mTOR inhibitor, exhibit immunosuppressant and antitumor activity, and extend survival of patients with metastatic renal-cell carcinoma (mRCC), advanced breast cancer and Pancreatic Neuroendocrine Tumour (PNET). Drug Instructions of Everolimus and Temsirolimus mention that patients taking any medicines for heart conditions or high blood pressure might need to be prescribed a different medicine or the dose of rapalogs may need to be changed. However, whether rapamycin induced cardiotoxicity and the mechanisms need further disclosed. Here, we showed that the primary cultured neonatal rat cardiac myocytes viability was reduced significantly after rapamycin treatment for 72 h. On the other hand, the cells with 3- Methyladenine (3-MA, an autophagy inhibitor) pre-treatment increased cell survival rate compared with rapamycin treatment alone. These results suggest that autophagy plays an important role in rapamycin-mediated primary cultured neonatal rat cardiac myocytes death. Rapamycin (Sirolimus), initially discovered as an antifungal metabolite, is an immunosuppressant which has been approved for clinical use as a drug for the prevention of renal transplant rejection and heart transplant rejection and vasculopathy [1-3]. Subsequently, rapamycin was found to possess antiproliferative properties in mammalian cells . Currently, the mammalian target of rapamycin (mTOR)-mediated pathway is widely implicated in cancer and has been validated as an important target for chemotherapy [5,6]. Two rapamycin analogs, temsirolimus and everolimus, were approved by the Food and Drug Administration (FDA) in 2007 and 2009, respectively, for the treatment of advanced Renal Cancer Carcinoma (RCC) [7,8]. To date, the FDA approved the use of rapamycin analogs for patients with several kinds of tumours, such as progressive neuroendocrine tumours of pancreatic origin, advanced HR+, HER2-Negative breast cancer and progressive GI and Lung neuroendocrine tumour . The sirolimus-eluting coronary stent was approved in Europe in Apr 2002 and in US in Apr 2003, following the antiproliferative effects of rapamycin in smooth muscle cell [10,11]. Inhibiting the mTOR by rapamycin would reduce restenosis and cardiac remodelling. In contrast, some studies showed that activating the mTOR signalling may mediate the beneficial effects of acute and delayed preconditioning to ischemia and several preconditioning mimetic drugs. Thus, rapamycin analogs may have either beneficial or detrimental effects depending on the experimental model and perhaps dose/ concentration and timing of administration [12,13]. In the present study, we showed that rapamycin treatment for 48 h induced cardiac myocytes damage in primary cultured neonatal rat cardiac myocytes, and autophagy involved in this process. Sprague-Dawley rat at 6 weeks of age were purchased from the Animal Research Center of Zhejiang Academy of Medical Sciences and housed in the laboratory animal center of Taizhou University at 22°C with a 12 h light/dark cycle. All animals used in the study were housed and cared for in accordance with the Chinese Pharmacological Society Guidelines for Animal Use. The work was approved by the Committee on the Ethics of Animal Experiments of the Taihou University. All surgery was performed under sodium pentobarbital anesthesia, and all efforts were made to minimize suffering. Rapamycin was purchased from LC Laboratories (Woburn, MA, USA). 3-Methyladenine (3-MA) was purchased from Selleckchem (Shanghai, China). Neonatal cardiomyocytes from the ventricles of 1-3 day old Sprague-Dawley rat hearts were dissociated by an adaptation of the method of Simpson and Savion. Briefly, the ventricles were digested with 0.125% Trypsin at 37°C [14,15]. Dissociated cells were preplated for 2 h in whole DMEM medium to selectively remove non-muscle cells. Myocytes were then plated in 6-well dishes (1 × 106 cells/well) in a 5% CO2 incubator and maintained in DMEM solution containing 20% foetal bovine serum/0.1 mM Brdu for an additional 72 h.
Cell survival was evaluated by CCK-8 assay kit (Beyotime Biotechnology, Nantong, China) according to the manufacturer’s instructions. Immunoblotting was conducted with standard procedures, using antibodies against LC3 and actin (Santa Cruz Biotechnology, Santa Cruz, CA). We first investigated the effects of rapamycin on cardiac myocytes proliferation in primary cultured neonatal rat cardiac myocytes. 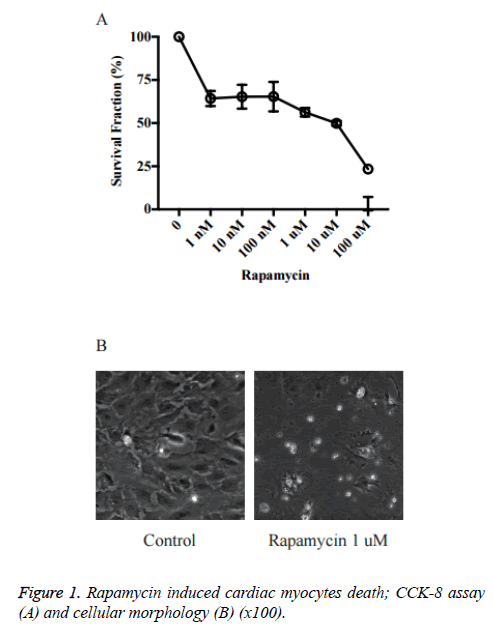 As shown in Figure 1, the cell viability was reduced significantly by rapamycin treatment. The rapamycin 1 nM~1 μM groups (~65%) already had a significant decrease in cell survival rate vs. control (P<0.05 vs. Ctrl). The survival rates in Rapamycin 10 μM and 100 μM was just about 40% and 20% respectively. Figure 1: Rapamycin induced cardiac myocytes death; CCK-8 assay (A) and cellular morphology (B) (x100). We showed that rapamycin exerts detrimental effects on primary cultured neonatal rat cardiac myocytes. However, the exact mechanisms remain unknown. Autophagy plays a critical role in cell metabolism by degrading and recycling internal components when challenged with limited nutrients. Several studies showed that autophagy could help cardiac myocytes overcome hypoxia/re-oxygenation-induced cardiomyocyte injury . However, the autophagy is a two-edged sword; mild autophagy supports cell survival while excessive autophagic stimulation can lead to autophagic cell death. Rapamycin is a classic autophagy inducer. We aimed to investigate whether rapamycin induced primary cultured neonatal rat cardiac myocytes death via autophagy signalling. As shown in Figure 2A, a diffused distribution of LC3 was observed in the control cells, whereas a punctate pattern of LC3 was observed in the rapamycin‑treated cells. 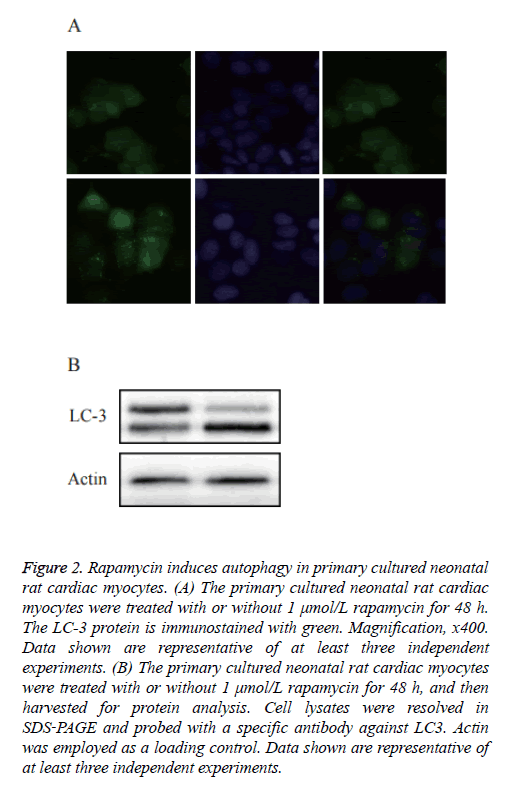 To further confirm whether rapamycin was able to induce autophagy in the primary cultured neonatal rat cardiac myocytes, an immunoblotting analysis was used to detect the cleavage of the LC3 protein. As shown in Figure 2B, western blot analysis showed a significantly increased expression of cleaved LC3. Figure 2: Rapamycin induces autophagy in primary cultured neonatal rat cardiac myocytes. (A) The primary cultured neonatal rat cardiac myocytes were treated with or without 1 μmol/L rapamycin for 48 h. The LC-3 protein is immunostained with green. Magnification, x400. Data shown are representative of at least three independent experiments. (B) The primary cultured neonatal rat cardiac myocytes were treated with or without 1 μmol/L rapamycin for 48 h, and then harvested for protein analysis. Cell lysates were resolved in SDS‑PAGE and probed with a specific antibody against LC3. Actin was employed as a loading control. Data shown are representative of at least three independent experiments. To confirm the role of autophagy in rapamycin-induced cell death of primary cultured neonatal rat cardiac myocytes, we pre-treated primary cultured neonatal rat cardiac myocytes with 3-Methyladenine (3-MA) to block autophagy (Figure 3A). As shown in Figure 3B, in control group, rapamycin could increase the cleaved LC3 significantly, while it did not happen in the 3-MA pre-treatment group. It reveals that 3-MA decreased rapamycin-induced autophagy. Figure 3: 3-MA attenuated rapamycin induced cardiac myocytes death via blocking autophagy. 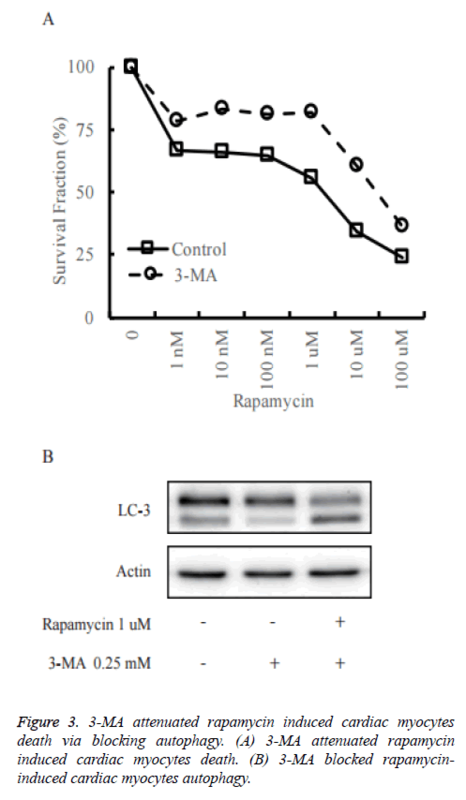 (A) 3-MA attenuated rapamycin induced cardiac myocytes death. (B) 3-MA blocked rapamycininduced cardiac myocytes autophagy. The cell death assay was measured by CCK-8 assay. The death rate was decreased when treated with rapamycin in 3-MA pretreated primary cultured neonatal rat cardiac myocytes in comparison to control cells. In the present study, we showed that rapamycin treatment for 48 h induced cardiac myocytes damage in primary cultured neonatal rat cardiac myocytes. Moreover, rapamycin could induce cardiac myocytes autophagy, and autophagy inhibitor 3- MA pre-treatment attenuated rapamycin induced primary cultured neonatal rat cardiac myocytes death. Rapamycin analogs have been widely used for cancer therapy, organ transplantation and Drug-eluting stent . However, cardiac toxicity caused by rapamycin analogs was not well revealed. Just as Garrett reviewed, rapamycin should have beneficial effects to reduce restenosis and cardiac remodelling . In contrast, several papers have also shown that activating the mTOR pathway may mediate the beneficial effects of acute and delayed preconditioning to ischemia and several preconditioning mimetic drugs, so drugs which inhibit mTOR such as rapamycin may have either beneficial or detrimental effects depending on the experimental model and perhaps dose and timing of administration. Rapamycin-induced autophagy should help cardiac myocytes survival in the stress of hypoxia/re-oxygenation, but wild autophagic stimulation might lead to cell death. Here, we showed that rapamycin did induce cardiac myocytes death in primary cultured neonatal rat cardiac myocytes, possibly through activation of autophagy pathway. Then we also showed that autophagy inhibitor (3-MA) could decrease rapamycin-induced cardiac myocytes death by blocking autophagy. In conclusion, our data provide more insights into rapamycin’s role in cardiotoxicity or caridioprotection. This will help us to constitute a viable strategy for alleviating rapamycin analogs cardiotoxicity. Thus, pre-treatment with autophagy inhibitors might constitute a potentially therapeutic option to prevent rapamycin-induced cardiotoxicity. The precise mechanisms still need further study. This work was supported by the Zhejiang Provincial Natural Science Foundation (grant numbers, LY15H310002 to G.C., LY15H310001 to X.D. LY16H310006 to J.Z. ); National Natural Science Foundation of China (grant numbers 81201530 to G.C. ); Public Technology Research Projects, Science Technology Department of Zhejiang Province (grant numbers 2016C37111 to X.D., 2015C37093 to J.Z. ); and Science Technology Department of Taizhou City (grant numbers 15yw08 to G.C.). Vezina C, Kudelski A, Sehgal SN. Rapamycin (ay-22,989), a new antifungal antibiotic. I. Taxonomy of the producing streptomycete and isolation of the active principle. J Antibiot 1975; 28: 721-726. Kahan BD. Efficacy of sirolimus compared with azathioprine for reduction of acute renal allograft rejection: A randomised multicentre study. Lancet 2000; 356: 194-202. Keogh A, Richardson M, Ruygrok P, Spratt P, Galbraith A, O'Driscoll G, Macdonald P, Esmore D, Muller D, Faddy S. Sirolimus in de novo heart transplant recipients reduces acute rejection and prevents coronary artery disease at 2 years: A randomized clinical trial. Circulation 2004; 110: 2694-2700. Kay JE, Kromwel L, Doe SE, Denyer M. Inhibition of t and b lymphocyte proliferation by rapamycin. Immunology 1991; 72: 544-549. Francipane MG, Lagasse E. Therapeutic potential of mtor inhibitors for targeting cancer stem cells. British J Clin Pharm 2016; 82: 1180-1188. Garcia CA, Wu S. Attributable risk of infection to mtor inhibitors everolimus and temsirolimus in the treatment of cancer. Cancer Invest 2016; 34: 521-530. Hudes G, Carducci M, Tomczak P, Dutcher J, Figlin R, Kapoor A, Staroslawska E, Sosman J, McDermott D, Bodrogi I, Kovacevic Z, Lesovoy V, Schmidt-Wolf IG, Barbarash O, Gokmen E, O'Toole T, Lustgarten S, Moore L, Motzer RJ, Global AT. Temsirolimus, interferon alfa, or both for advanced renal-cell carcinoma. New Eng J Med 2007; 356: 2271-2281. Motzer RJ, Escudier B, Oudard S, Hutson TE, Porta C, Bracarda S, Grunwald V, Thompson JA, Figlin RA, Hollaender N, Urbanowitz G, Berg WJ, Kay A, Lebwohl D, Ravaud A, Group RS. Efficacy of everolimus in advanced renal cell carcinoma: A double-blind, randomised, placebo-controlled phase iii trial. Lancet 2008; 372: 449-456.
de Melo AC, Paulino E, Garces AH. A review of mtor pathway inhibitors in gynaecologic cancer. Oxidative Med Cell Longevity 2017; 2017: 4809751. Kalra A, Rehman H, Khera S, Thyagarajan B, Bhatt DL, Kleiman NS, Yeh RW. New-generation coronary stents: Current data and future directions. Curr Atheroscler Rep 2017; 19: 14. Toutouzas K, Di Mario C, Falotico R, Takagi T, Stankovic G, Albiero R, Corvaja N, Colombo A. Sirolimus-eluting stents: A review of experimental and clinical findings. Zeitschrift Fur Kardiologie 2002; 91: 49-57. G JG. Rapamycin (sirolimus): A two-edged sword? J Mol Cell Cardiol 2006; 41: 226-227. Zeng LH, McDaniel S, Rensing NR, Wong M. Regulation of cell death and epileptogenesis by the mammalian target of rapamycin (mtor): A double-edged sword? Cell cycle 2010; 9: 2281-2285. Qin J, Liu ZX. Fak-related nonkinase attenuates hypertrophy induced by angiotensin-ii in cultured neonatal rat cardiac myocytes. Acta Pharm Sinica 2006; 27: 1159-1164. Simpson P, Savion S. Differentiation of rat myocytes in single cell cultures with and without proliferating non-myocardial cells. Cross-striations, ultrastructure, and chronotropic response to isoproterenol. Circ Res 1982; 50: 101-116. Evans TD, Sergin I, Zhang X, Razani B. Target acquired: Selective autophagy in cardiometabolic disease. Sci Signal 2017; 10.